Green Chile Food Company of Las Cruces, N.M., is recalling approximately 252,854 pounds of ready-to-eat (RTE) meat and poultry frozen burritos that may be adulterated with Listeria monocytogenes. The recalled products, bearing establishment number “M-21740 or P-21740” inside the USDA mark of inspection, were shipped to institutions, retail stores and distribution centers in California, Illinois, Oregon and South Dakota. 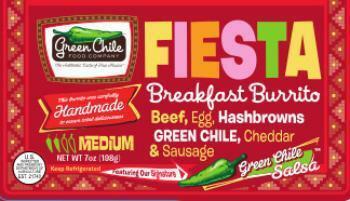 Consumers with questions regarding the recall may contact Green Chile Concepts at (800) 695-0843.